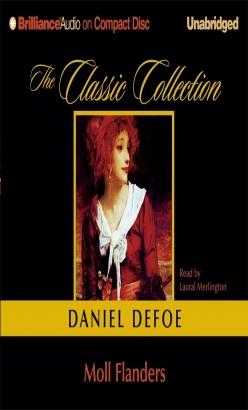 Moll Flanders, Defoe's 18th century classic novel, was "marketed" in its day in much the same way that a modern commercial novel might be - its title page promised the racy details of a woman's life spent in thievery and whoredom. The book is much more than this; it is a Puritan tale of sin, repentance, conversion, and redemption. It is also seen by many critics as a satirical and ironic picaresque novel with a twist (that being its female protagonist). On yet another level, it is a playful and beguiling social commentary set between the Puritan age (which saw humankind as fallen) and the Age of Reason in which humankind was seen as born innocent and good and corrupted by society. Taking center stage in this whorl of irony, humor, pathos, and religious faith is one Moll Flanders - both the most plausible sinner and the most pious repentant in English literature; arguably the most notorious heroine in the canon of fiction in the English language. She is as controversial today as when she first appeared in 1722.